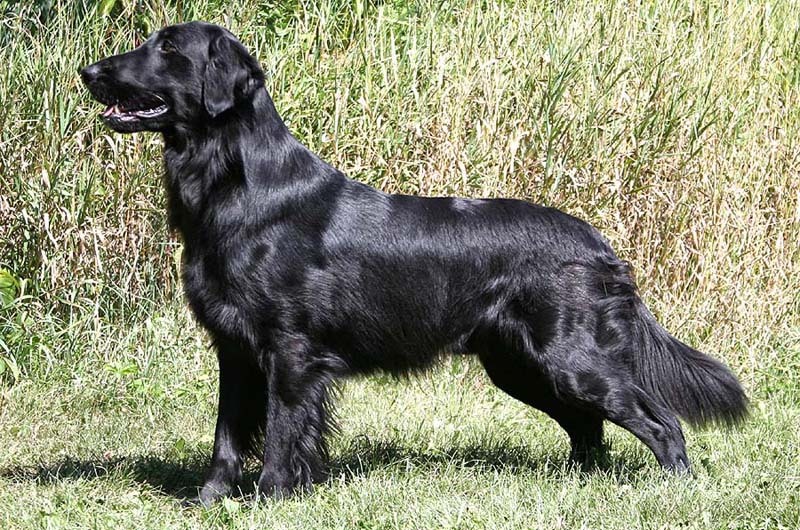 A powerful and elegant breed, the Flat-Coated Retriever is characterized by clean and fluid features that are free of exaggeration. 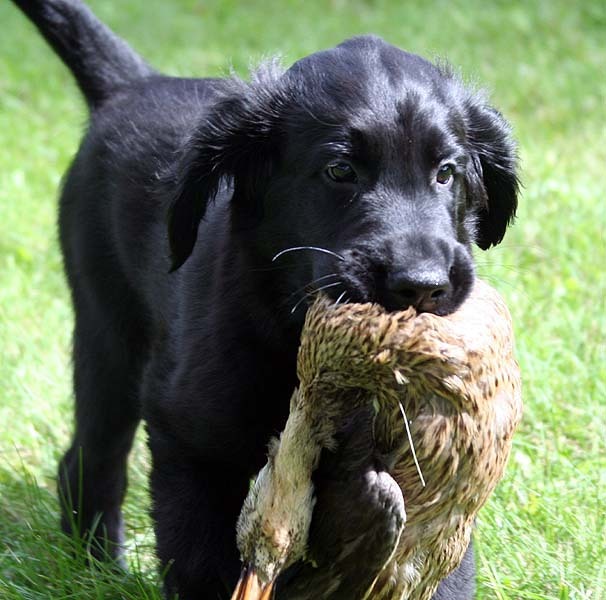 The muzzle, like the rest of the head, is long and deep, capable of holding large waterfowl. 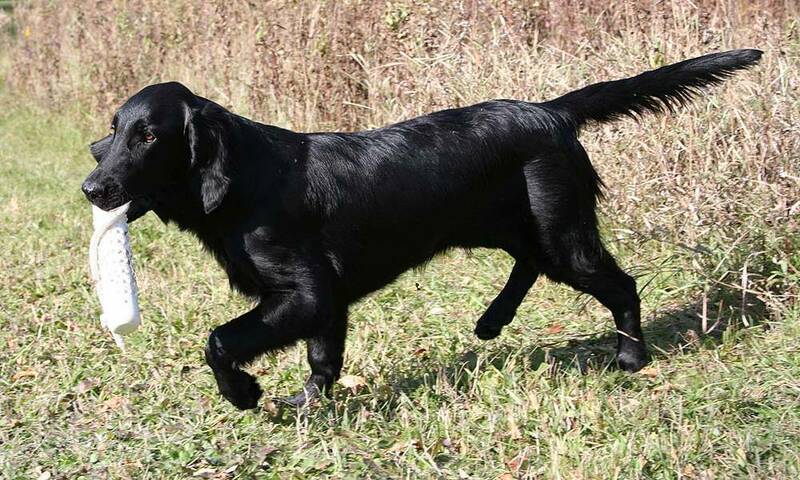 The stop is gradual and the lines of the head are smooth and finely hewn, giving the dog a look that some have described as cast in one piece. 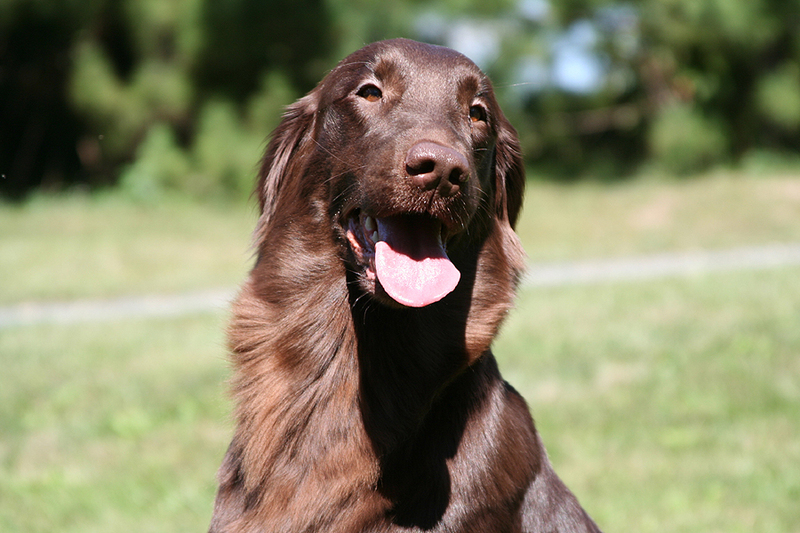 Eyes are almond-shaped and hazel or brown in color, and give the dog a kind, intelligent expression. 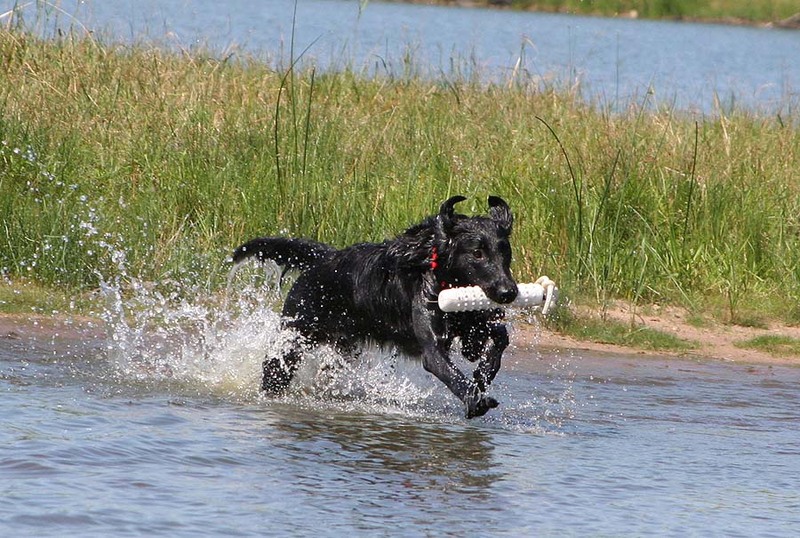 The neck is fairly long, connecting to a straight back and athletic body that is slightly longer than tall. 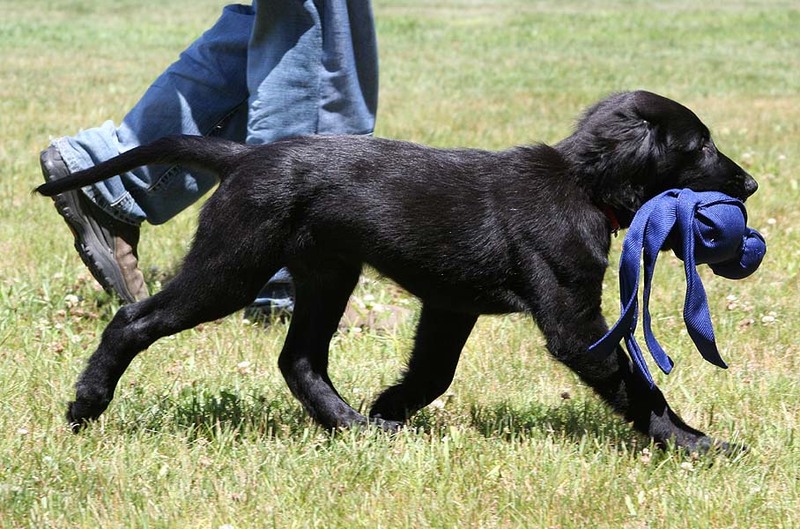 The legs are strong, and the tail is carried straight and horizontally. 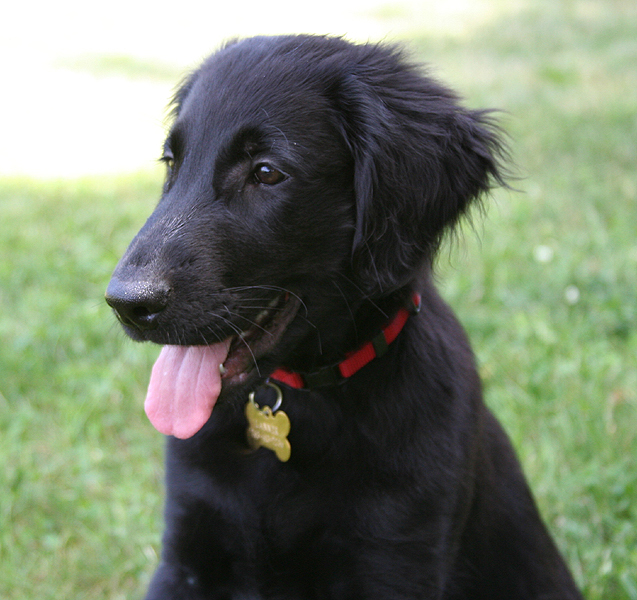 The thick, medium length coat lies flat against the body and is either solid black or solid liver in color. 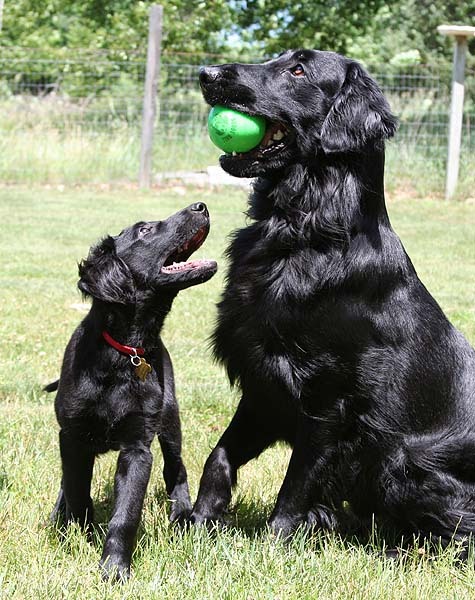 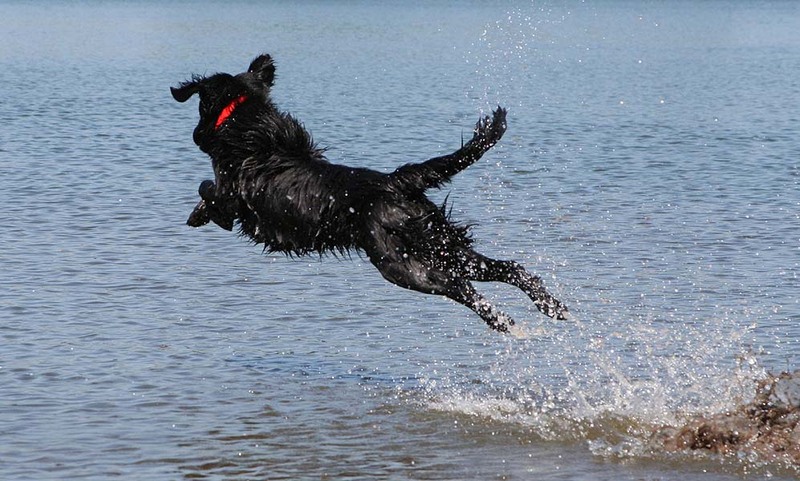 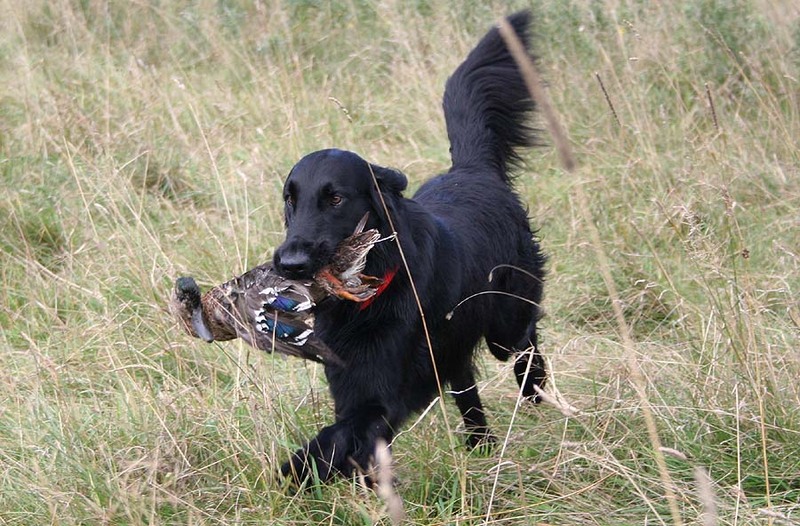 The Flat-Coated Retrievers gait is smooth and efficient. 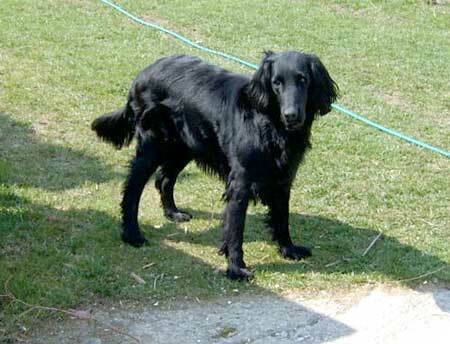 Height (Male) 23 - 25"
Common Misspellings Flat-Coated Retreiver, Flat-Coted Retriever or Flat Coated Retreever. 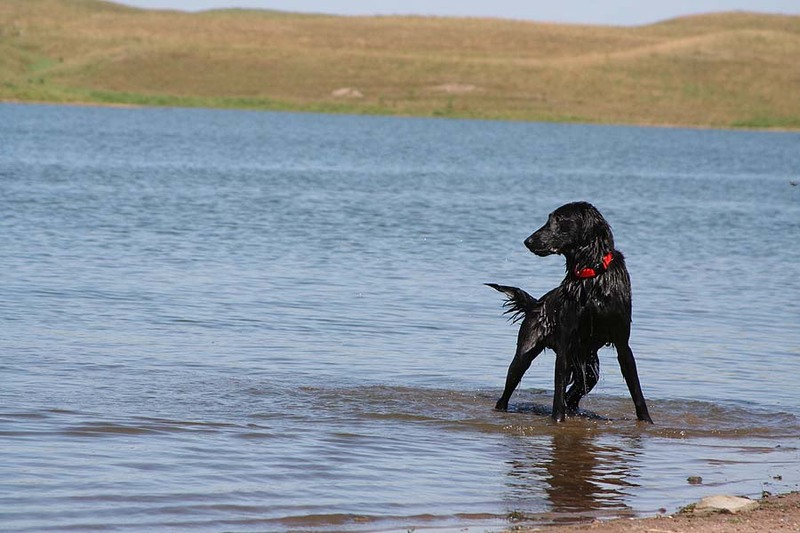 Friendly toward other dogs, pets, strangers and children, this retriever makes an excellent companion. 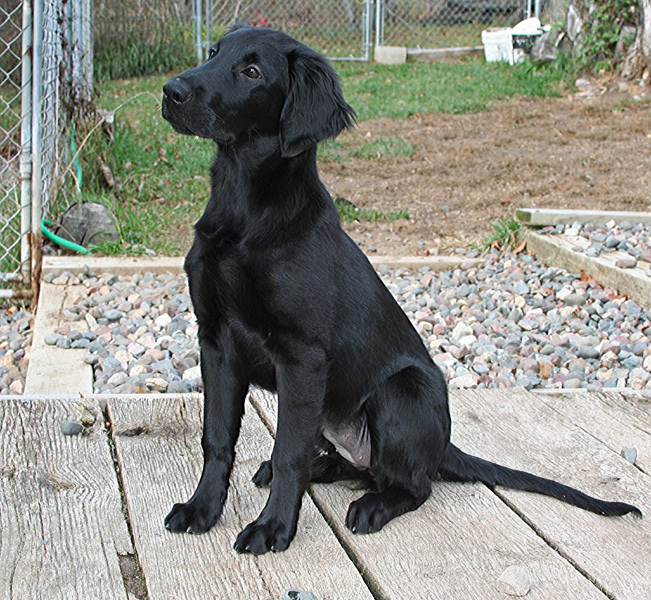 Though this is an active dog, it is very capable of being quiet and calm when indoors, provided it is properly trained and exercised. 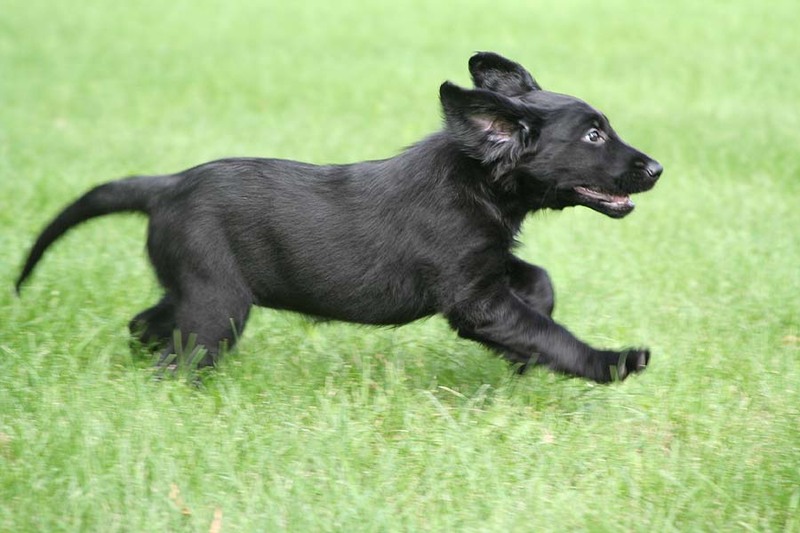 A family who takes this breed into its home will be blessed with a devoted companion that always says hello with a cheerful smile and a wagging tail. 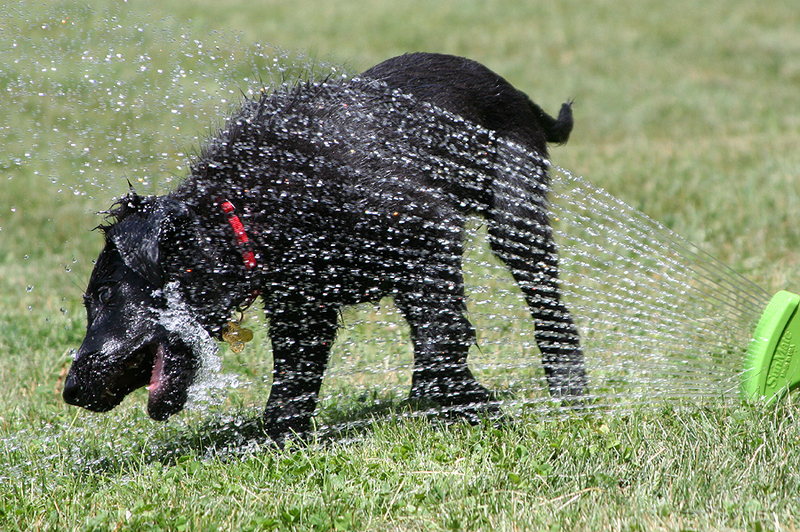 This being the case, it needs daily exercise. 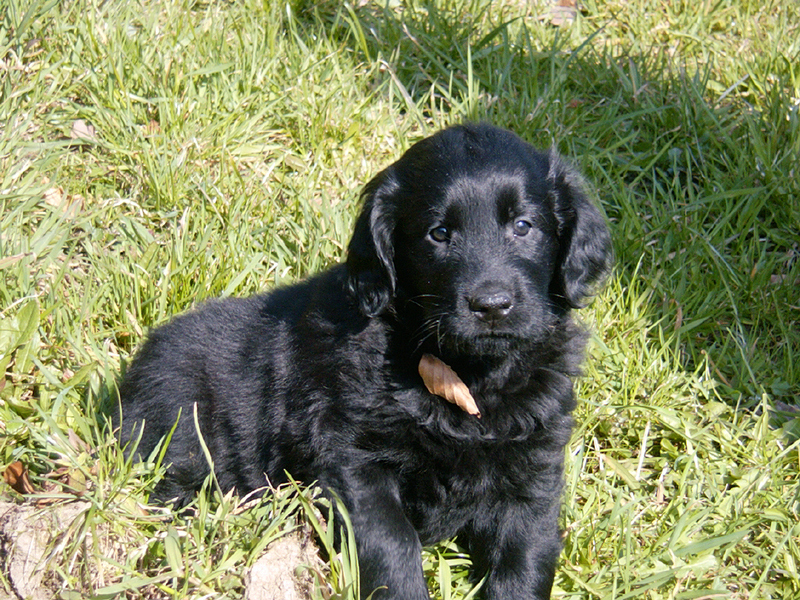 The Flat-Coated Retriever is a family dog, so a situation in which it can live indoors and play outdoors is ideal. 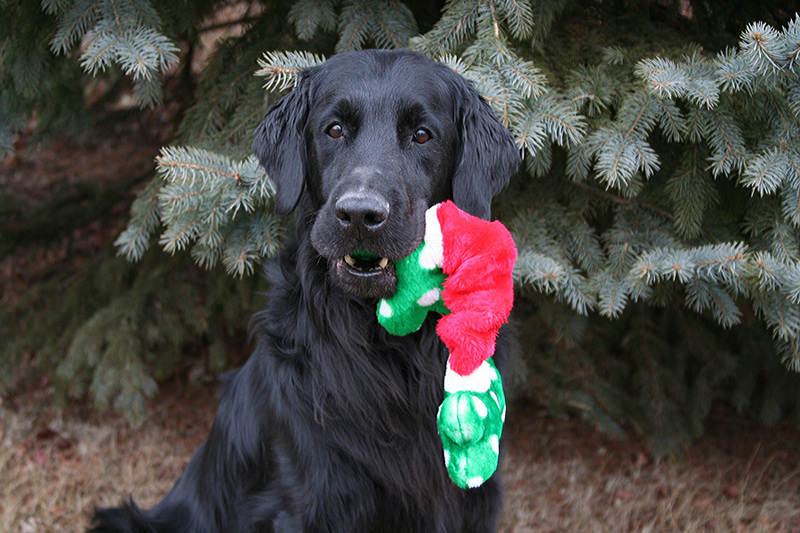 The coat is fairly easy to care for, only needing a weekly brushing and occasional minor trimming. 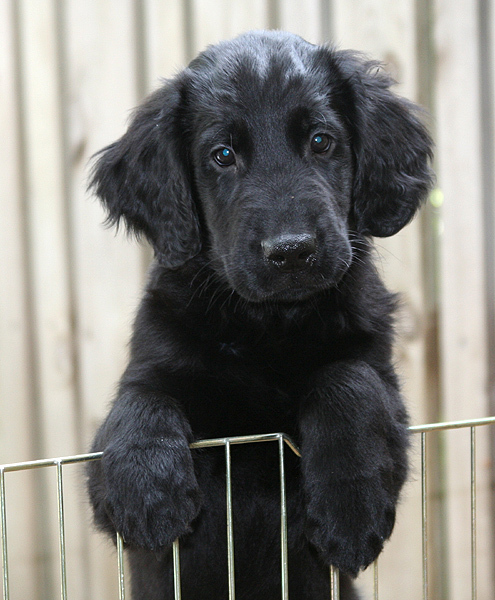 The Flat-Coated Retriever is a healthy breed, though it can be susceptible to canine hip dysplasia, gastric torsion, patellar luxation, glaucoma and hemangiosarcoma. 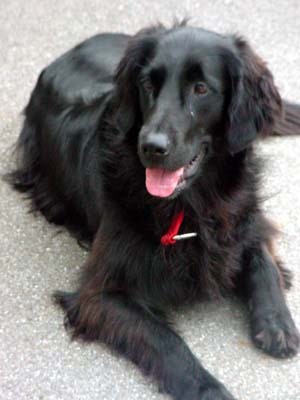 The Flat-Coated Retriever is descended from the Retriever Proper, which is in turn a product of crossbreeding between Newfoundlands, setters, sheepdogs, spaniels, and various other water dogs. 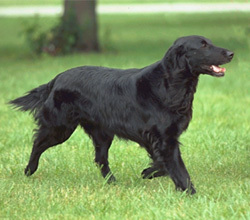 The ultimate purpose of these combinations was to create a dog that could spot, locate, swim and retrieve downed waterfowl with ease, and eventually these crosses led to the emergence of the Wavy-Coated Retriever, forerunner to the Flat-Coated Retriever, during the mid-19th century.By 1900, dog fanciers had deemed the wavy coat to be insufficiently water repellent, and further breeding with straight-haired dogs produced the Flat-Coated Retriever as we know it today. 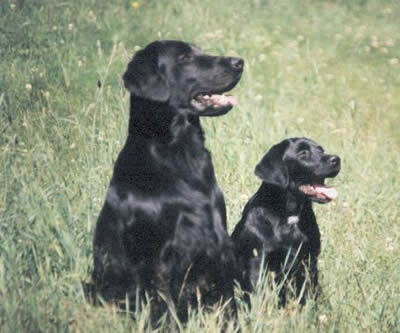 The breed was recognized by the American Kennel Club in 1915 but did not fare well in the World Wars and was nearly extinct by the late 1940s. 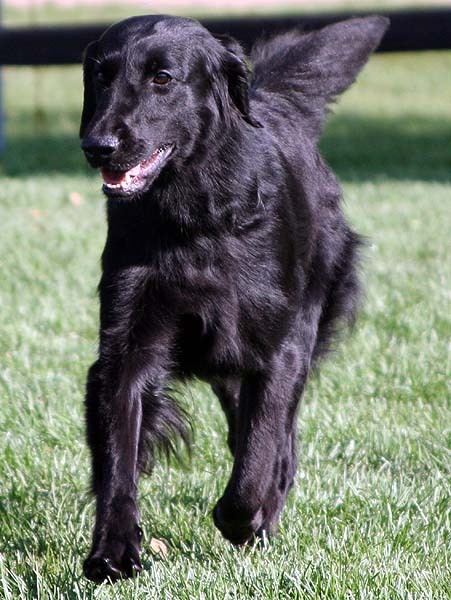 At this point Stanley ONeill, a Flat-Coated Retriever expert, began efforts to revive the breed, and by the late 20th century the breeds future was secure. 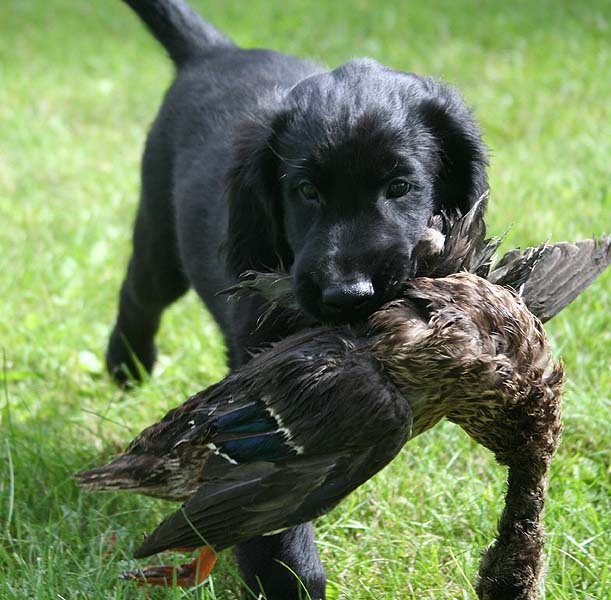 Though there are many who appreciate the dogs hunting skills, the Flat-Coated Retriever has never been wildly popular as a pet.